Really want to like this app, but I can’t seem to add a task on day two of using it. I use this app all the time. I love to check things off lists so this app makes me a happy girl. It just makes my head less jumbled by writing down what I need to do. I use the free version and it seems to be adequate for my personal needs since I’m not juggling kiddos anymore. Thank you for helping me keep everything organized. Trying to login with Google, I can't use any of my keyboards...basic or Grammarly. Update: developer contacted me, we are attempting to figure out why. This app has been a life saver. I get so caught up in my day-to-day that I tend to forget very important things. I function better with check lists so this was really helpful. 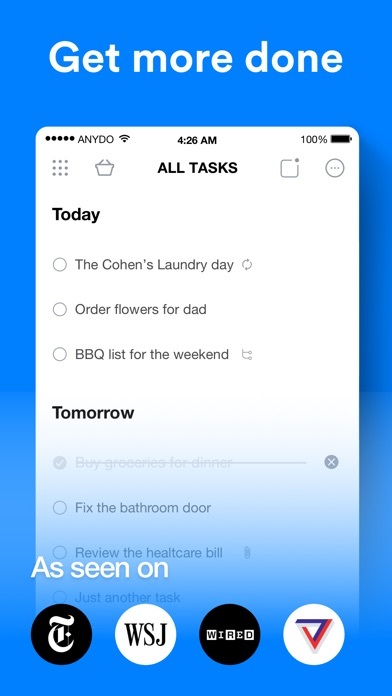 I love the plan my day feature so I can decide what will be done today and when to remind me about a task later if I need to push something back later. The best thing about the app is it’s connection to Alexa and Siri so I can add to my reminders and lists in one place and on the go. However, the bells and whistles stop there. I paid for the “premium” version with the misunderstanding that it would have a more robust calendar function. It doesn’t. The only difference with the calendar is that you can change colors in the premium version and that is hardly worth the money. 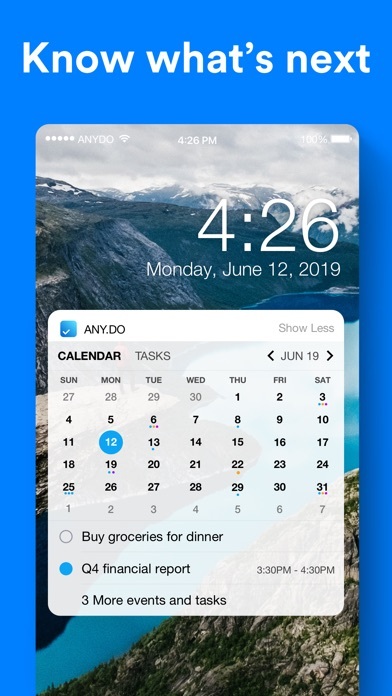 I need to have tasks and the calendar in a single app, and while it does this, there are much better apps for such integration. Not being able to see a day at a time or have alternative calendar views is the greatest weakness in this app for someone looking for an integrated task/calendar organization system. It would seem like an easy fix for an app with so much potential. I will not be buying the premium edition if I continue to use it at all. I must’ve met when I first got this app I was a little disappointed but over time the developer has updated this app and has made it better. The integration with Alexa is excellent and very useful I like the plan your day ability. 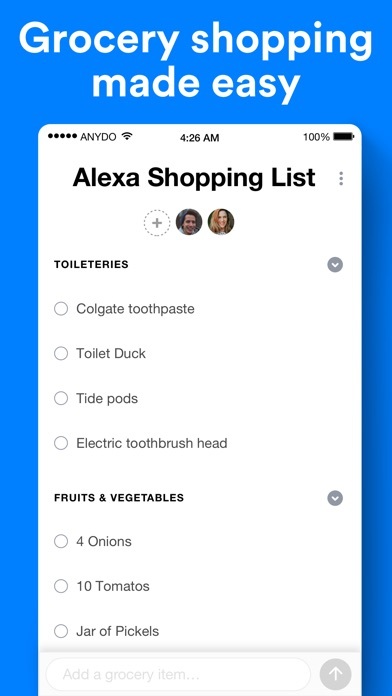 The shopping list has improved and it just shows that the developers want to make this an excellent program. Only worthwhile premium function doesn’t work. I love the standard Any.do functions, they’ve really made a great product that is intuitive and works well. I decided to try out the premium features because the location reminder service standard in the iPhone Reminders app is lacking. This was the sole reason I decided to pay for the premium features. Unfortunately, the location reminder feature has never functioned correctly. I spent time working with customer support and trying all of the “troubleshooting” they offered. Nothing worked and the problem persisted. I finally grew tired of waiting several days in between responses and asked for a refund. I was told that Any.do as a company has no control over refunding customers and I’d have to go through Apple. I submitted a request to Apple and was told that they could not issue me a refund for this purchase. It seemed like an automated response. Honestly at this point I just gave up, it wasn’t worth the wait trying to get my money back. After about two months of only using the app for simple lists I received a response from customer service saying they’d updated the app and fixed the location reminder issue! Fabulous! Well, I just updated the app and went through the process of setting up a location reminder and the feature STILL does not work. I’m at a loss for how this is possible. 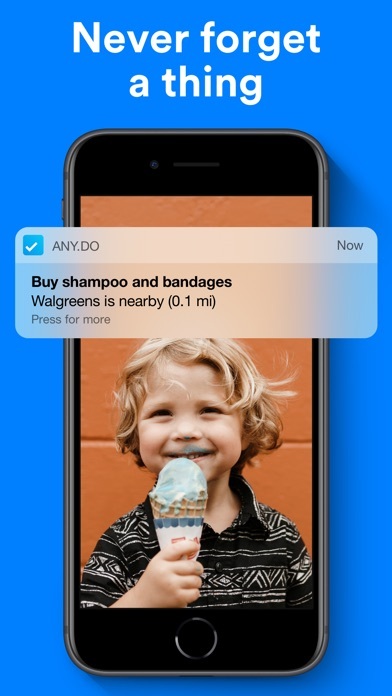 It seems like Any.do isn’t testing their product in real world situations before making claims about what it can do. If their reviews were based on the premium features offered and not the simple free version of the app I’m sure their rating would be much lower. I’ll rate the app again if they can ever fix this basic issue, but until then this app can’t be used as advertised. Update 4/10/19 The developer contacted me and informed me that the most recent update fixed the issue. Unfortunately this wasn’t true for me. As I stated before, I was in contact with their tech support and continued to use the basic features of the app until this update was available. It was only after downloading the updated version and seeing that the location reminders still did not work that I left my review for the product. I will gladly update my review again if the problem is ever fixed. And to top it all off, it looks like they released ANOTHER update just a couple of days after I unsubscribed from the premium features of the app. Did this update finally fix the issue? How could anyone know without paying to find out? I’d recommend that anyone who wants to purchase premium features solely for the location functionality check other users’ reviews before doing so. I eventually was refunded by escalating the issue directly to Apple, but in my opinion Any.do dropped the ball by not ensuring a feature functioned on all devices before deciding to charge for it. Great concept but since I paid for premium I’ve been unable to get my alerts to work. Specifically I’m trying to set up an alert when I arrive at or leave from a certain location. It just never works. I’ve contacted Premium Support 4 times now. The first 3 times they responded with telling me to uninstall and reinstall the app and to check my notification settings. I’ve done all of that and now they just don’t respond. Makes my life so much easier to manage! !